Take-Two also said that it plans to continue the BioShock franchise, despite the closure of Irrational Games. Red Dead Redemption has become somewhat of an oddity in the game's industry - a hugely popular title from a major publisher that's over four years old and hasn't had a sequel released yet. But, that doesn't mean Take-Two has forgotten about it, as big boss Strauss Zelnick confirmed to Gamespot that "Red Dead is a permanent franchise" in the same vein as Grand Theft Auto. He also talked a little about the future of the BioShock franchise, which has kind of been up-in-the-air since the closure of Irrational Games. Zelnick said, "We haven't given any color on how you should think about [BioShock] yet except we do believe it's beloved; we think it's important [and] certainly something that we're focused on; something 2K Marin will be responsible for shepherding going forward. I don't want to say much else except to agree with you. I think there's a lot of upside in that franchise." 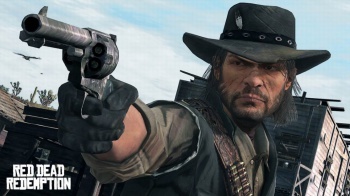 With E3 coming up around the corner, and some recent rumors suggesting that Take-Two is prepping something to do with Red Dead Redemption, could we possibly see a sequel announced at the event? As for me, as a PC gamer, I'm just hoping we'll finally see a PC port of the original game.